I bought the LUSH Turkish Delight Shower Smoothie in my LUSH haul back in March. Lather up with our delightfully buttery rose-scented shower smoothie. Each pot is made with superb quality ingredients including aphrodisiac jasmine and Turkish rose, smoothing almond oil, moisturizing cocoa butter and neroli – the euphoric essential oil. Smooth on this softening smoothie in the shower, let it sit for a minute then rinse off for clean, touchably soft and fragrant skin. A pot of this suits all skin types, but it is particularly good for dry and sensitive bodies that need moisture. Smooth all over your wet body in the shower, let the luxurious oils and butters go to work softening and cleansing your skin, and then gently rinse away. First thing I noticed: it doesn’t seem to clean the skin on its own. I attempted to use just this product alone but I did not feel it was making my skin feel clean. There’s no lather at all, it just turns into a milky mush on the skin. So then I thought this might be more of a skin conditioner, like those popular in-shower body lotions. I decided to use a normal bar of soap to clean my skin first, then I apply this afterward as my second step… and it was still a total letdown. It doesn’t “stick” onto the skin. It just kind of falls off, and when I rub it into my skin, it quickly dissolves and rinses away. So while it’s a good thing that it doesn’t leave a film on the skin, it also doesn’t provide any added moisture as claimed. And since it doesn’t seem to do much, I end up trying to use more and more product in hopes it will do something. I always end up using a body lotion in addition to this when I get out of the shower. Another nit: the scent doesn’t linger much on the skin. Which is, in a backwards kind of way, a good thing for me since I didn’t care for the smell of this. Lastly, I disliked digging my hand into this pot to use it. Imagine this, I’m in the shower, the water is raining down from the shower head – I have to unscrew the lid while keeping the opened tub away from the shower stream. Then I have to scoop a handful from the tub and slap it onto my body in sections (all the while the product is just falling off my skin and rinsing down the drain – bye bye money!). If you have a massive shower stall where you can stand entirely away from shower stream, then this wouldn’t be an issue for you. I’m not sure if this product could be put into a squeeze tube but that would be a preferable delivery system. Rose Water (Rosa centifolia), Glycerine, Rapeseed Oil, Coconut Oil (Brassica napus; Cocos nucifera), Almond Oil (Prunus dulcis), Fair Trade Organic Cocoa Butter (Theobroma Cacao), Water (Aqua), Sodium Hydroxide, Fragrance, Rose Oil (Rosa damascena), Rose Absolute (Rosa damascena), Jasmine Absolute (Jasminum grandiflorum), Neroli Oil (Citrus Aurantium amara) , Propylene Glycol, Sodium Chloride, EDTA, Tetrasodium Etidronate, Benzyl Salicylate, Geraniol, Citronellol, Hydroxcitronellal, Alpha-Isomethyl Ionone, Limonene, Linalool, Titanium Dioxide, Red 33. It has 14 month shelf life, which is pretty long for a LUSH product, actually! For me, this is just a nothing product. It doesn’t lather. It doesn’t really clean my skin. It doesn’t provide additional moisture. I can’t smell it much after it’s rinsed off. It doesn’t delivery on the promise of “touchably soft and fragrant skin”. Ugh, why did buy this? It costs $35.95 for 200g of product. I’m angrily using this up (do you do that, when you dislike a product but just want to use it up and get it out of your life? You slap the product on your skin while cursing it?) and then the container will be saved as part of my trade-back for a free Fresh face mask. At least one good thing will come out of this! Have you tried a body smoothie from LUSH? This has such a nice sounding name, too bad the product isnt good! Yes on paper it is lovely! I wish I loved it but I don’t. Ah well! Definitely! Yup, sadly that is the case for many products, sounds exciting but in the end not so much! So you’re just standing there in the bathtub with this on? Hmm ok… I shall try. I’m about half way through this tub. Maybe I’ll keep it for Fall / Winer time to use the rest. It is entirely wasted right now. Menthol on the skin is no no for me! I’m not giving up on LUSH stuff, this one was just a let down! 😦 I’ll look into that Rose Argan oil. Sounds great in theory, but given your description I will fo shizzle pass on this, it was actually one of the few lush products I had on my list to check out! I’m currently angrily using up a load of things muttering to myself “I don’t want to waste it, but I don’t want to use it either”. Next time you’re in LUSH, please smell this and let me know if I’m imaging things – this doesn’t even smell like roses! Haha yes, that rationale – I can’t waste this so I’m just slap it on! Grrr. I will do I’m very fussy about rose scents! Ahh the slap it on where you use double the amount to get through it a bit quicker? I’ve been there! OMG it looks like a tub of fancy ice cream. I want Turkish Delight ice cream NOW. Sorry to hear it’s so disappointing! I love your knowledge of obscure perfumes! I’ve never even HEARD of Ava Luxe Loukhoum and Keiko Mecheri Loukhoum! How did you even come across these?! 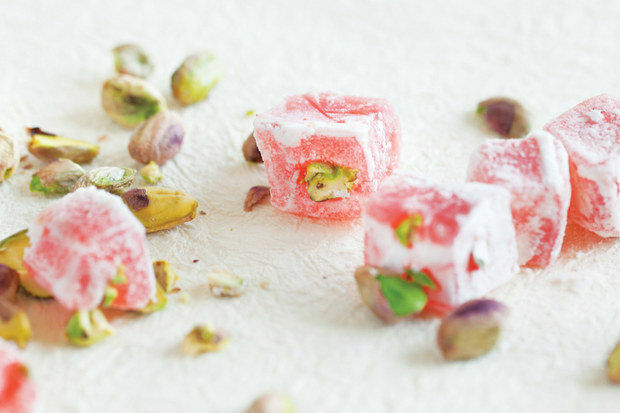 Oooh I wonder if there is a Turkish Delight ice cream flavour out there…? I love Keiko Mecheri’s Loukhoum – but I love the Poudrée version even more. Anyhoo, they’re both divine. I don’t know the Ava Luxe perfume, but I sniffed the Serge Lutens Rahat Loukoum ages ago. It’s similar to KM Loukhoum. Yeah, I’m a fragrance nut too. 🙂 I love cheap drugstore stuff, and I love to buy nail polish at Poundland, but I also love niche perfumes. It’s odd, I know! Thanks, that’s great to know! The KM is much easier to come by 🙂 I must try the Poudrée version! I’ve been having some expensive product mishaps lately, heh! I know, just think how much actual soap I could have bought. Maybe I’m old fashioned but I really like bar soap! I use both but my husband will ONLY use bar soap. It’s cheaper and I feel like it lasts longer. OMG SO WEIRD! That’s my husbands favorite brand! Boo, this product sounds so bleh! Like omymercy said in the comments above, the only other way I can think of using this product is like a hair conditioner, you turn your water off, slather this on your skin, and then rinse… don’t know if that would make much of a difference! I use up products I don’t like ALL the time, just for the sake of using them up 😐 it’s not that much fun! I think I’ll feel silly standing there in the bathtub without the water running lol! I will try it though! Skincare is usually the worst culprit for angry usage – I’m in the midst of using up a Shiseido serum too and it’s making me MAD! You’re right, skincare is usually the worst! It always feels like if the product is crappy but it’s not making your skin break out, then you should probably use it up…but it’s not a pleasant experience! No, I don’t do that! I put conditioner in my hair and tie it up so it’s out of the shower stream. And when I use body wash, I just lather it up on the side of my body that’s away from the stream – then I rotate and repeat. SO ODD, the showering habits of people! 😆 I guess we do what we’re taught by our parents? Haha it’s so funny, you never really think about the fact that people SHOWER differently. I think people’s shower routines definitely come from parents! I can understand why you don’t turn the water off during your shower though…it gets cold when you’re standing without water for too long! I’m relieved this didn’t cause any issue with my skin but I understand what you mean about hit & miss with LUSH – I always check the ingredient list to make sure there’s nothing irritating. Yes, and we save and savour things that we love – how odd! If you’re at LUSH, you should go smell it. Doesn’t smell like Turkish Delight! I have stepped into Westfield two weeks before for shopping and I had headed straight into Thorntons and since that day, I’m eating Turkish delight everyday non-stop and this post reminds me of my inner Childness. I haven’t had Turkish delight in ages. It’s difficult to find a source for good quality ones here locally! Aww! Here, in Thorntons, we have the best. Wow! So many ingredients to name for like floral scents of jasmine, rose, neroli and nutty sweet flavours from almond oil and cocoa butter. Gorgeous! I pretty much guess that it is packed with aroma and sweetness. It sounds like something that would be amazing. Shame it wasn’t…especially if it doesn’t clean. Haha right!? It’s supposed to clean and it doesn’t even do that! Too bad it didn’t work out. I felt the same way with the DeFluff shaving cream. I’m actually wanting to try the Dream Cream but I’m having a hard time forking up the money for it. I think I tried Turkis Delights when I was in 4th grade or so. We were reading The Lion, The Witch and The Wardrobe and they had Turkish Delights so they teacher thought it would be great for us to experience them. I can’t really recall what they tasted like, I just remembered it was weird. Now you got me curious to try them again though just to see. I got the Dream Cream in my LUSH haul too. I have yet to try it but it smells lovely! I’ve never tried any Lush’s shower smoothies before. But I heard from friends that Ro’s Argan Body Conditioner is amazing for moisturizing your skin in the shower. I’ve heard good things about that one too. I’ll have to look into it next time I’m at the LUSH store. Thanks so much for the rec! I laughed out loud at the”angrily using this product up” bit. I feel your pain though! Bummer that this didn’t work out for you! Lush is bad like that, I haven’t tried too much from them because they’re so pricey and their products seem to be kind of hit or miss. Yeah, this one just isn’t a good rose based scent. Also, because it has jasmine, it ruins it for me as jasmine is one of my most disliked scents. I do like the ro’s argan body conditioner – but I’ve only ever gotten samples because it is around 35$ for 225g! I like Jasmine! But this just doesn’t smell either like rose or jasmine to me. I’ll have to go try the Argan one… I know, they’re pricey but if it’s awesome, I am willing to treat myself occasionally! this doesn’t look appealing to me. I kept going to Lush hoping I can find something to bring home to try but nothing really caught my attention so far and the scent is just not for me I guess. What a waste of $$ this product is.. And funny how you see people talking about their shower routine.. I like HOT water when I shower.. and when I finished bathing I can see my skin turned so red and the whole bathroom is foggy.. LOL which led me to having a really dry hair since I use warm (but my hubby says HOT) water when I shower. does any of you do the same? Yup, you are definitely at your best when you hate products. Another lovely read! I could see this stuff fall of your skin in a little heap of useless misery. I have never tried this, because it actually smelled artificial to me in store already. I do find lush can occasionally go a little overboard in scents. I do exactly the same with products I hate: I grudgingly try to finish them to feel i haven’t wasted my money hating them all the while.